The Maverick Caulking Gun is a drip-less, lightweight plastic weighing just 345gm, with a ratchet style and strong 70kg of force the rotating barrel enables the nozzle to be moved into tight places. The nozzle cutter is in the handle along with a cleaner that enables you to remove any excess filler from the nozzle after use. 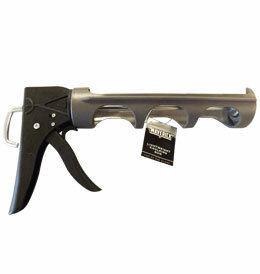 Finger support for greater control of the gun and a durable construction so the gun won’t break if dropped.